Lock in a great price for Paradise KohYao - rated 8.7 by recent guests. 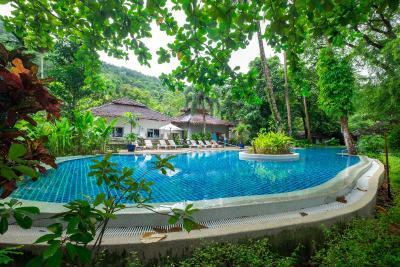 Comfortable Unit with great private jacuzzi overlooking trees and sea , located in the midst of nature, beautiful natural setting, great views from the beach into Phang nag bay, bird song to wake you up. 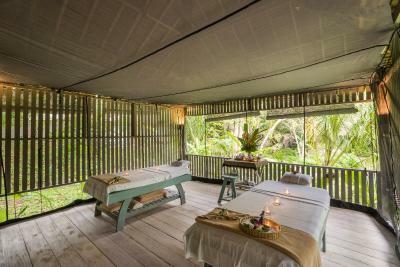 Great place for yoga., Complementary lesson and half hour massage. 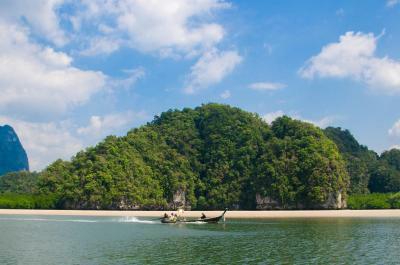 Nice outing into beautiful Phang nag bay by long tail boat. Very friendly and helpful staff. 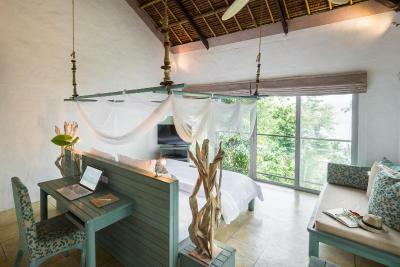 Absolutely stunning rooms overlooking the beach. Beautiful long golden sand beach. 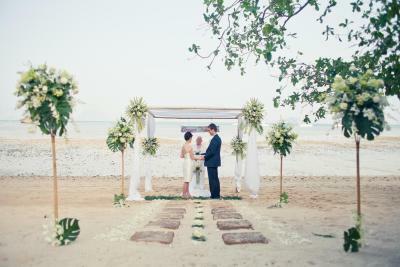 This small resort really felt intimate and as if you were somewhere remote. We spent three night here and had a wonderful time. If you stay longer you would want to rent scooters but the road out of Paradise is quite treacherous! Breakfast was great with a large selection. Staff were friendly as long as you are patient and friendly back. They are local and English is not there first language so be kind! Lovely watching the hermit crabs going about their day (in the evening) look but don’t touch! Beautiful Room Excellent jacuzzi Wonderful private beach Nice breakfast buffet Happy hours!! In the middle of the forest. One of the best beaches I’ve ever seen! The place is amazing, a beautiful beach. It is quiet and perfect for a break. The staff is nice and the food is good . It was like paradise ! This is by far the best resort I have ever stayed in. It is both luxurious with immense attention to detail, yet at the same time very laid back and incredibly relaxed. The pool, beach, and restaurant were never crowded. 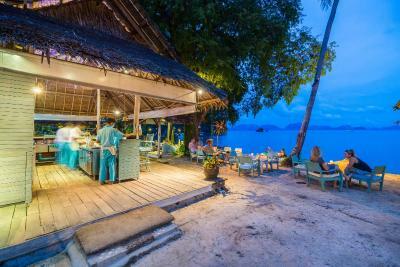 The food was excellent and I enjoyed that the restaurant was directly on the beach. I especially liked that 95% of staff are hired directly from the island. The remote location made it feel very special and additionally the room felt very private and secluded. I would definitely come back and stay again. 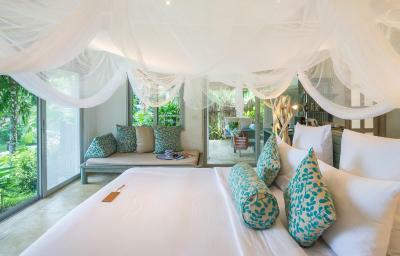 The seclusion, peace and quiet, rooms and bathroom v spacious, decor in rooms good, staff v accommodating and polite. Food generally good, especially breakfast! 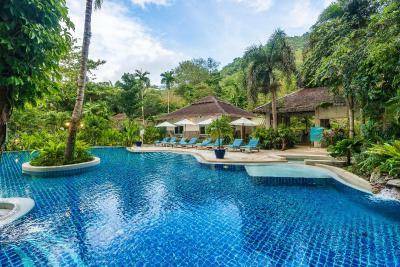 One of our top picks in Ko Yao Noi.Nestled in the northern tip of the Koh Yao Noi island in Phang Nga Bay, Paradise KohYao offers an outdoor salt-chlorinated infinity pool and 250 yards of secluded private beach surrounded by towering limestone cliffs and tropical rain forest. 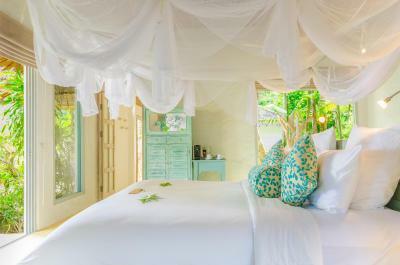 The shabby-chic Paradise KohYao features white-washed woods and turquoise accented linens throughout the resort. 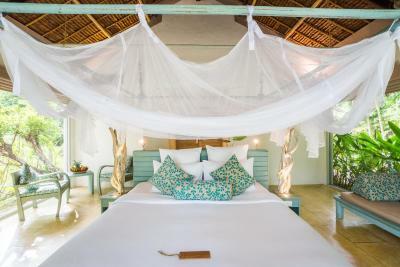 Rooms come with air conditioning, beds draped with mosquito nets, an open-air bathroom and an outdoor terrace with the resort's signature swinging lounge chairs. Inside, guests will find a TV with international channels and a minibar. 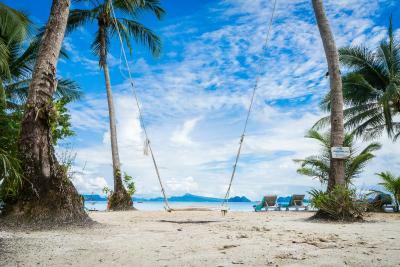 The on-site tour desk can arrange excursions to the surrounding islands such as the famous James Bond Island in addition to many other local half and full day trips. 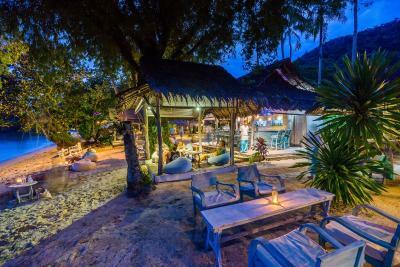 Guests can make use of the chargeable shuttle service to visit the local village, from where they can rent a bicycle or motorbike to explore the open rice fields and markets of Koh Yao Noi island. Free WiFi access throughout the resort and private parking are offered. Books, DVDs as well as indoor board games and puzzles are also available at the library. 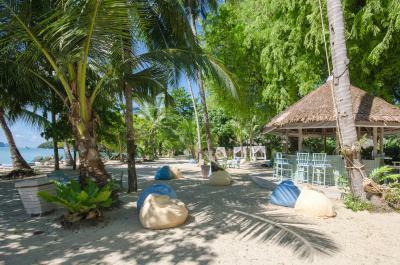 The resort offers guests with a wide range of dining options. 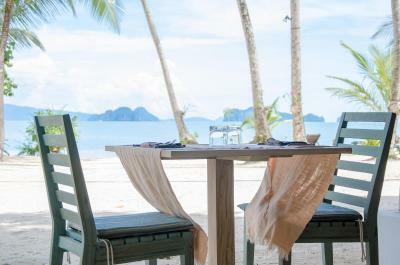 Guests can sink their feet into the sand at The Seafood Terrace that opens all day and serves a hearty buffet breakfast and local Thai and Western favorites for lunch and dinner. During the day, tasty snacks and drinks can be ordered from the Beach Club Bar, located in front of the pool. 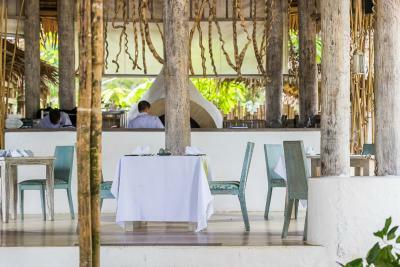 In the evenings, the Al Fresco Restaurant serves delicious Asian-Western fusion a la carte menus. At the end of the day, lounge on the beanbags, sip the special cocktails and enjoy sunset views at the Sundowners Bar while enjoying discounts during the happy hour. 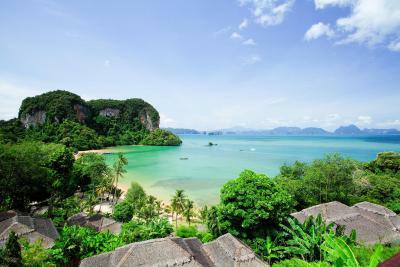 From Phuket Airport, the resort can be reached within a 15-minute drive followed by a 60-minute boat ride from Bang Rong Pier followed by an adventurous 30-minute car ride. 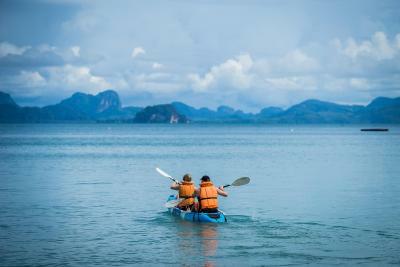 From Krabi, the island is located a 40-minute long tail boat ride from Tha Len Pier. Private transfers can be arranged for an additional charge. Paradise KohYao has been welcoming Booking.com guests since 15 Apr 2010. When would you like to stay at Paradise KohYao? This air-conditioned studio features a private balcony, a satellite TV and a minibar. An en suite bathroom comes with a shower and free toiletries. Bathrobe and slippers are offered. Spacious air-conditioned studio features a hot tub, a private balcony and a satellite TV. Free toiletries and a bathtub are included in an en suite bathroom. 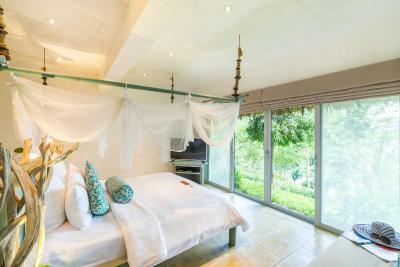 Offering a private spa pool with a sea view, this air-conditioned studio comes with a fan and a seating area. Its en suite bathroom has a shower, a hairdryer and free toiletries. Bathrobe and slippers are offered. Guests enjoy a satellite TV, a minibar and wake up service. 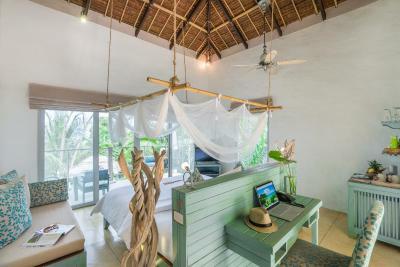 This villa features a balcony, minibar and bathrobe. This studio has a balcony, DVD player and bathrobe. 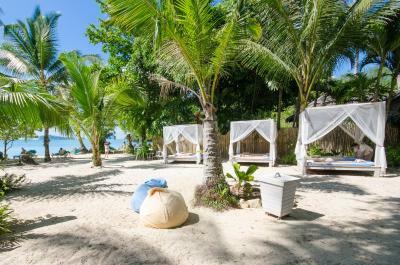 Paradise KohYao is a boutique resort & spa that offers a true escape for those seeking privacy & seclusion, without compromising comfort & convenience. 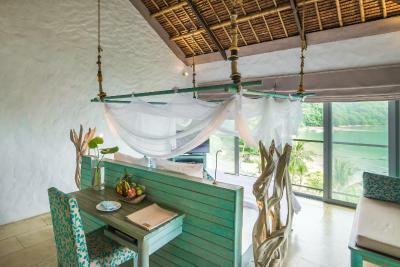 Our romantic holiday resort has recently been refreshed with a new look that blends shabby chic design with natural materials, to truly harmonize with nature. House rules Paradise KohYao takes special requests - add in the next step! Paradise KohYao accepts these cards and reserves the right to temporarily hold an amount prior to arrival. Please kindly be informed that the hotel transfer is for the minimum of 2 persons and the service is only available during day time from 09:30 to 17:00 daily. To be able to catch up with hotel's boat service, guests have to arrange the flight that arrives at the airport not later than 16:00 and departs from the airport not before 10:00 hr. 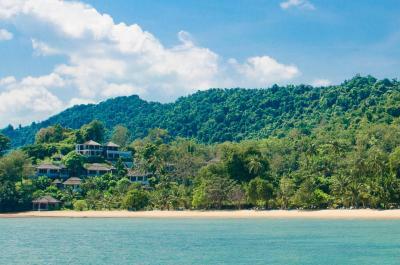 Pick up service area available from two airports including Phuket Airport and Krabi Airport. However, special schedule can be arranged upon request. Please contact the property for more information. The property offers a chargeable speedboat transfer between the property and Yacht Haven Marina (Phuket)/Tha Len Pier (Krabi). This fee is payable directly at the property. Guests wishing to make use of this transfer are kindly requested to inform the property of their arrival details during the booking process. An airport pick-up service via limousine and minibus is available between 06:00 - 16:00 hrs. To reserve the transfer, please inform your arrival details at least 3 days prior to arrival. 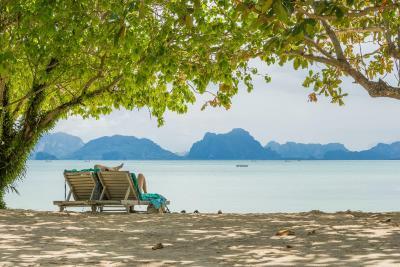 Any flights arriving after 16:00 hrs will be required to stay overnight in Phuket or Krabi and arrange for another transfer service the following day. Please note that these transfer services offered by the hotel are non-refundable. We didn't enjoy that there was no pick up at pier. We paid a taxi 1000thb to get to the resort. The road was not even a road. You pay a lot of money to arrive covered in red dirt all over your suitcases, hair and teeth. To leave to go to town to look around or explore the island, there was no complementry shuttle. You had to pay more than the taxi to do so and were left to the hotel's time restrictions of 2 hours. We were hoping to rent motorbikes and explore a bit on our own, but the poorly maitained 6 km dirt track of a road in and out of the resort would prove difficult to even a seasoned motorcylist is also something not mentioned until you get there and see for yourself. 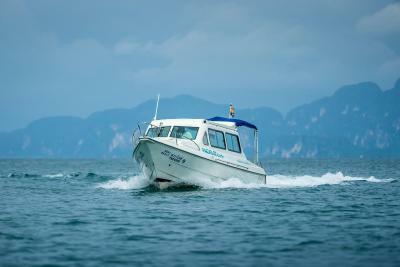 The trip excursions to spots literally a short boat ride away were more expensive than taking the same trip booked from Phuket. No one tells you that there is no swimming in the ocean all afternoon due to low tide. You just see beautiful pictures of water and sand but in reality it's like that in the morning and late evening. There isn't enough pool chairs. My 65 year old mother, my 6 year old daughter and I, had to sit on the floor on our towel next to the pool because people had "saved" the chairs but never turned up for most of the afternoon to use them. There should be no "reserving" such limited amout of seating. In the restaurant, I understand. The stone edging in the pool was very sharp and my daughter cut her knee and foot several times. We liked the pool and the rooms had a great view of the wild life. Service staff was friendly. The spa was nice and relaxing. The food was nice and portion sizes were great. Batik paiting was fun. Food was not that good. Could be much better. Food was not very good compared to ie Thai food at Khaoshan BKK or Chiang Mai night market and was very expensive compared to prices in Thailand. No possibility to go for dinner outside the resort. Units need maintenance (shutters, railings, etc). The drinks were expensive and very weak. We were not looking to get drunk at all but a strong gin and tonic is important! This goes for all of Thailand though. The tide is out for a lot of the afternoon but we enjoyed the ever changing scenery so didn’t matter to us so much. Once you are in the hotel you are stuck with their restaurants, as it is quite isolated, and the prices are very expensive for the location/ quality. It is nearly impossible to swim for most of the day because of the extremely low tide. Communications with the staff can be challenging, the reservations team gave me some wrong information about the transfer options which made us loose nearly a day of our holiday. Beautiful and quiet location in the middle of nature. The beach villas are really pretty and comfortable. Swimming at the beach can be painful due to plankton. Swimming at the beach are not avaiable during low tide, so plan your time. 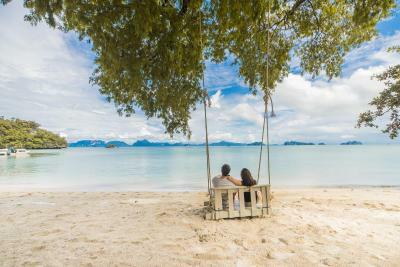 We visited paradise Koh Yao for the last part of our honeymoon and it was perfect- really relaxing, friendly & warm staff and we were treated to a complimentary bottle of fizz on arrival. Before we arrived we read some concerning reviews about the prices and the fact it’s cut off from the rest of the island; prices are higher than other non-resort parts of Thailand, but slightly cheaper than typical UK prices. In terms of being cut off this is true - it’s hard to get to and excursions are expensive, as a result of this we stayed there for the time we were there, but as we’d visited other areas of Thailand before, we were advevtured-out and more than happy to chill at the resort. 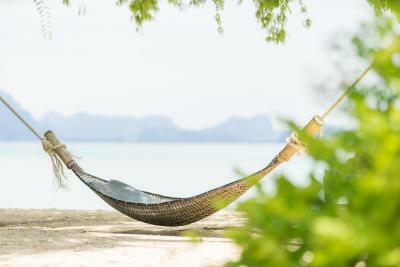 For relaxing times it truly is paradise! Both restaurants. The service in both restaurants is quite bad, there is lack of organization and the staff always seem lost and desperate, always saying sorry when coming to the table. The pictures don’t match the reality of the rooms. The prices are a little expensive.